INDIANAPOLIS, IN – Annex of Kokomo, a student housing community in Kokomo Indiana, managed by Landmark, was awarded Best Student Housing Community in Indiana by the Indiana Apartment Association’s (IAA) 2017 Prodigy Awards on Tuesday, October 10th. 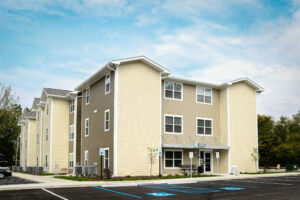 The Annex of Kokomo received the prestigious award of Best Student Housing Community in Indiana. Coll ege students in Kokomo may not have the option to live off campus, but with the Annex of Kokomo they can enjoy all the best aspects of on-campus living. The Annex of Kokomo is an affordable student living community that gets students close to campus and activities. With all-inclusive rates, an amenity package second to none, great relationships with the university, and proximity to IU Kokomo, The Annex of Kokomo is the only purpose-built student housing provider. Our robust Resident Life program gives students as close to an experience to traditional on-campus housing life as you can get in the area. Additionally, our on-site team of staff welcomes residents by name and takes the time to get to know each person, creating a warm and comfortable home-away-from-home environment. The Annex of Kokomo reached 100% pre-leased occupancy rate for August move in by June and 27% of those are renewals. This is also the first property in the portfolio to receive 100% pre-leased occupancy for the year. In addition, The Annex of Kokomo has over 94% resident satisfaction rating; over 25% renewal rate. All of this is a great measurement of success. The IAA Prodigy Awards program is held annually to celebrate multifamily housing companies and professionals that have demonstrated excellence in the previous year. Prodigy Awards are given to properties/companies who are top performers in several categories including marketing programs, resident retention, curb appeal, maintenance programs, staff training programs, and community amenities. The Prodigy Awards are presented in conjunction with the Awards of Excellence at the annual President’s Award Dinner, which takes place at the close of the widely attended Midwest Multifamily Exposition and Education Conference.